doing some writing on my laptop when there suddenly appeared, 6 feet away in my peripheral vision, a black, shiny, undulating, blob that quickly disappeared. I thought it strange yet chalked it up to eye fatigue from too much computer time. A few hours later I was lying down reading a book on my couch when another black blob ( a larger one) appeared in my peripheral view less than a foot from my head. It looked as though a hand was reaching towards me from inside this blob as it manifested then quickly dissipated. This one I couldn’t dismiss because it was so close to my head thus allowing me to see all the details. I actually jumped when this blob appeared and said out loud “Holy Crap! What was that?” But as the human mind does, it was quickly justified as eye-fatigue and then forgotten. About a month later I read the story (which I can’t seem to find now) of a man who was talking to a Shaman who said “You know those black blobs you see? That is “them”” He was referring to the Sasquatch people. This utterly floored me knowing that someone else was experiencing these same blobs that were the Sasquatch People. From the time I last saw those blobs there have been no more visits …that is until yesterday. I was looking down at my cellphone when, what looked like, two small black blobs(that were connected in the middle) appeared 1 foot from my face and slightly above my head. While at first I assumed it was nothing (why I keep downplaying them is ridiculous) the events that transpired yesterday made me change my mind about their sudden appearance. reside in the subconscious which consists of one’s fears and insecurities. One of my biggest fears, as with most people, is based on my inability to trust the universe to take care of me which has resulted in me making many life choices unsuitable for my specific needs . In other words I’ve made choices out of desperation which meant I was not trusting the guidance of my higher self but rather society’s expectations. I recognized this fear arising yesterday after having committed to an art project that I didn’t feel comfortable doing at this time. The reason for this discomfort was due to time constraints in which I was trying to get a lot of work done in a short period of time. I told myself that this was not a problem but it WAS a problem. This is a story that has played itself out repeatedly in my life yet I never want to let others or myself down by having to cancel. After stressing for several days about getting all this artwork done ,in a short period of time, I finally realized that I was choosing to do this work out of fear rather than excitement. . So I did something I wouldn’t normally do in that I cancelled which resulted in me spending the rest of the day wondering if I had done the right thing. On one hand I felt as though cancelling was the best move for me yet my mind was trying to convince me otherwise which made me feel a great deal of shame. This struggle lasted most of the day which, I suspect, caused a visit from the black blobs again. Fast forward to this morning when I expected to wake up with a feeling of sadness over my inability to follow through on this art project yet that is NOT what happened. Instead I woke up feeling elated and as though I KNEW I had made the right choice. The more I thought about the black blobs the more I realized that I felt fully supported for my choice by the Sasquatch people which was likely due to this being a positive turning point in my psyche. I also can’t help but be reminded of the trail of white feathers that play into this story which I will explain a bit later. First let me tell you about the pictures I have included. of any significance until I got to the narrow side where suddenly a Sasquatch face, brow bone included, was staring out at me. This stunned me as I had looked the rock over many times yet didn’t see the face before. Now I carry the rock in a pouch around my neck with a crystal and other healing stones. Another picture you will see was referenced in my previous post in which I asked the Sasquatch for a glyph which appeared by a sandbox near a school. I saw this glyph shortly after requesting it as I walked through the park on my way home. The use of tiny white feathers is significant to me because of the one I found on my bathmat in the previous post and the fact that I feel they’ve nicknamed me “little feather” due to my sensitive and empathic nature. I felt that the feathers were almost ceremonial in nature, welcoming me on my new path of awakening and understanding. Unfortunately I didn’t take pictures of the feathers because I was very tired (I had walked a long way) and wasn’t clueing- in to the meaning of the feathers at that moment. It seems this happens a lot with me in that I don’t understand, or believe signs until I give them a second thought some time later. In conclusion I have to say that I am quite astonished with how unique each person’s interaction with the Forest People is and how they choose to communicate with each of us based on certain aspects of our personalities. 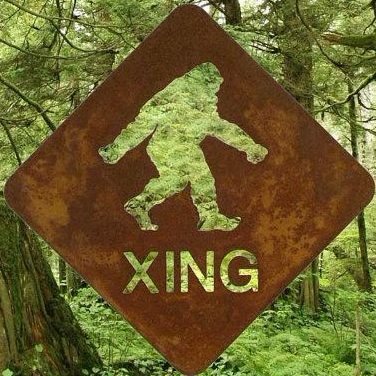 For me, the Sasquatch have kept a distance so as not to scare me and yet have done things that shocked me yet left me feeling very comfortable with them. I have to say that the whole Sasquatch phenomenon has opened my mind in such intricate way that I have as of yet to find words to express any of it. I just know that I look forward to whatever is coming next.